Saturday morning usually means two things: a) I’ve got a hangover and b) I’ve overcome this to go out and buy the Guardian. It’s doom and gloom in the main section and slim pickings in the rest of the paper at the moment though. About the only noteworthy thing in the whole of today’s newspaper is the fact they have overhauled the Weekend section. It isn’t particularly radical. In fact, it mostly consists of including a lot more white space. However, they have made everything a bit simpler and bolder and it works well despite the fact a cynic might think they were just padding out the magazine in these lean times. The contents themselves are mostly unchanged. They still start with the relentlessly banal celebrity Q&A, for example. It does have a new general knowledge crossword but it is a bit pointless and also tricky to write on what with the paper being all shiny. Elsewhere on the same page, I got 6/15 on the quiz this week and, more importantly, learnt about the darts player with the best nickname in the world. It was a novel I first opened owing to the compelling evangelism of Nick Hornby, who made one of the suicidal characters in his 2005 novel A Long Way Down carry a copy of the book, so that it could be discovered on his corpse – an inspired continuation of the books romantic, self-sacrificial agony. Hornby almost single-handedly triggered a resurgence of interest in Yates, which led very materially to the emergence of this movie, a serious and intelligent response to the novel. Now, I’m sure Hornby helped but I would suggest the 2000 Vintage edition of the novel with Richard Ford’s evangelical introduction had rather more to do with it. By the time Hornby’s novel was published it was already canonised in Time’s All-time 100 Novels list. Her face, so powerful in its impassivity, yet with unreadable hints of fear and anger, has something massive and monumental about it up on screen, the sculpted form of a Roman empress: like the gigantic marble head of Faustina the Elder, famously unearthed with the colossal statue of Hadrian in Turkey last year. David Barnett has a post up on the Guardian Book Blog about that old favourite, As Others See Us. I have long held the view that rather than just being harmless smirking at the ignorance of others who Just Don’t Get It this sort of thing is actually indicative of a poisonous persecution complex that hurts the SF community. Barnett pitches his piece in an agnostic tone, it is designed to generate debate rather than impose a view. It is mildly disappointing to see the same old suspects being brought up – Margaret Atwood features prominently – and the same old arguments being re-hashed but the comments to the article are actually some of the more balanced I’ve seen on this issue. As it happens, Atwood will be publishing another SF novel – The Year of the Flood (Amazon have got the title wrong) – later this year. It appears to be set in the same world as Oryx And Crake or the synopsis references it, at any rate, but the events of that novel don’t seem entirely compatible so it will be interesting to see how it turns out. I am certainly looking forward to it though and hope to review it later in the year. It seems appropriate to close this entry with this: Margaret Atwood On Science Fiction – The Great Hits. So I make 60 that out of 149 which is considerably better than the 15 or so I was averaging for the other lists. There are some interesting books on there I’ve never heard of like Pig Tales. There are some selections which probably won’t seem to make much sense with a coupel of years hindsight like The Night Sessions. There are several writers who don’t appear for their most important book, the maddest of which must be the choice of Years Of Rice And Salt instead of Three Colours Mars. All in all, a nice chewy list though. The Guardian have now published the full list of all one thousand books. 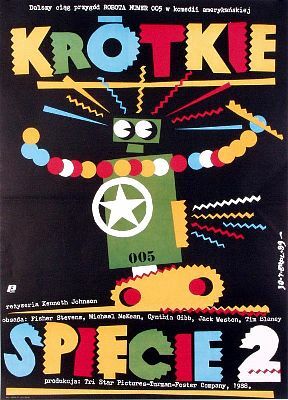 A brilliant collection of Polish film posters.